Denise Weeks, Mystery Author: Is this real?! OR am I being played like a Stradivarius? Is this real?! OR am I being played like a Stradivarius? HEY, Y'ALL!! What do you know about these blog awards? I've supposedly been nominated and I'm supposed to reply to "accept the nomination." 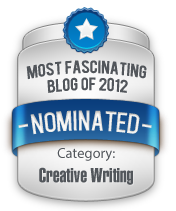 Which blog was it that got nominated? Possibly not this one. This one is the pro blog. My personal journal is more of a "rip open soul and rummage through to see what revelations might stun the masses most" blog. Maybe the other blogspot one. Who knows? Or is it a scam in some way?? Is my blood sugar just low or something? This triggers my doubt-meter for some reason. But I would be thrilled if I were actually finally GETTING some recognition. Go figure the egoboo. Here's the "nominee badge" that we're encouraged to display. Their site wanted me to "copy this code to display the badge," but I don't like to point to pictures on someone else's site; they often remove the pic and leave a photo-hole in my blog entry, and they convolute matters. So I just copied the dang badge. Sort of strange? OR legit? Ever seen that before? Anyone? Bueller? Bueller. . . ? The award looks like a jar of mayo. This might color one's perceptions.